Known for one of 2013’s most popular restaurants, the Monsieur Bleu and Chloe boutique, , Joseph Dirand has designed a penthouse in Saifi area in Beirut, in a building by Raed Abillama Architects. The interior of this penthouse portrays his style in using soft figured furniture in strong masculine spaces. Such an elegant interior. 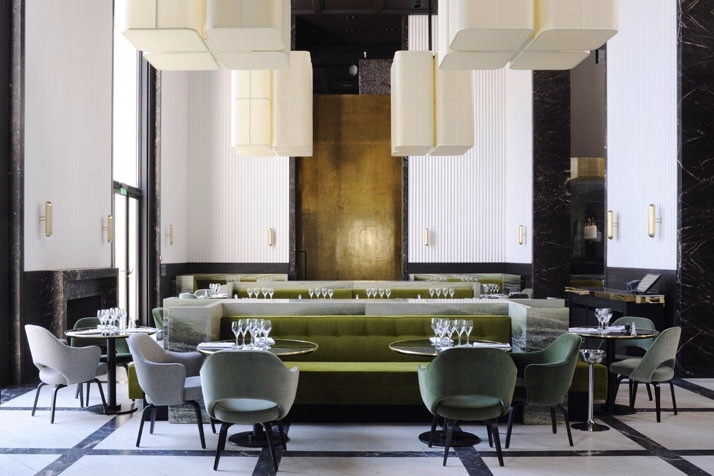 Located in the new wing of the Palais de Tokyo, perched on the quays of the Seine just across from the Eiffel Tower, Monsieur Bleu caters equally well for sociable suppers, business lunches, family meals, artist meetings, or indeed lively late-nights. Its kitchens open around the clock, offering menus full of flair but conscious of the simple needs of the lunch-breakers, This versatile address designed by the architect Joseph Dirand, both cosmopolitan and international, presents a haven as delectable to the gourmet as it is to the gourmand, a living space where you may nibble just as easily as you’ll lunch, a forum for chance encounters as much as regular rendez-vous and if you fancy a dance, well you can do that too. The bar menu has been created created in collaboration with Alix Lacloche.